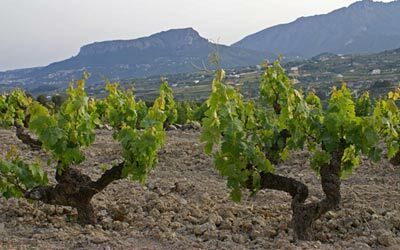 In 2003, after 18 months of living in a very small village just outside of Denia (link), my children and I moved to a village house in the gorgeous Jalon Valley which holds a special place in my heart. The first Citrus Iberia office was opened there, my children (after 18 months in a Spanish school), went to the Lady Elizabeth school and we all formed friendships which are still in place today. The Valley has a mix of everything on offer and although now it has a large percentage of expats in its population, it is still a typical Spanish village – famous for its blue domed church, the Saturday rastro market which runs alongside the river and of course the Jalon Valley wine. The Valle de Pop region is also a favourite with cyclists, ramblers, scramblers and those looking for a quiet and beautiful place to buy a holiday or permanent home. Visitors flock here in late January and early February when the flowering almond trees turns the valley floor into a spectacular carpet of pink and white almond blossom, again in high season to escape the madding crowds of the beachfront, and then in September to watch the farmers of “wine valley” harvest their grapes. Thirty years ago only a trickle of tourists drifted in and out of the valley. 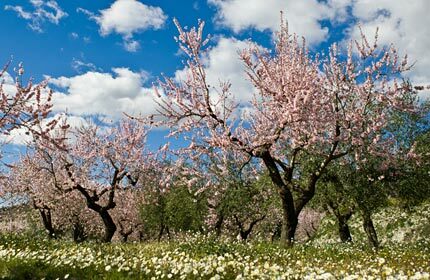 Some came to buy their wine at the famous bodegas of Jalon whilst others came to capture the awe-inspiring sight of the almond blossom which adorns the valley with a carpet of pink and white in late January and early February. Tourists and foreign home buyers have been drawn to the valley in their droves in recent years as word began to spread among the foreign community that the Vall del Pop was not only a beautiful place to visit but was also a treasure trove of excellent and reasonably priced bars and restaurants. Disillusioned with the over development of the cluttered costas, an increasing number of ex-pats started to buy holiday and retirement homes in the valley and tour operators decided it was a worthy destination on their list of top 10 coach excursions. Urbanisations started to spring up along the mountainsides and package holidaymakers from Benidorm and beyond booked day trips to the Vall del Pop with the aim of savouring a taste of “the real Spain ”. The upshot of all this is that a sizeable foreign community now co-exists with the local Spanish communities who continue living their lives much as they have done for generations and Jalon Valley life remains much as it used to in years gone by. The Jalon River runs through the heart of Jalon and is crossed by two town bridges. On the one side you have the main town, communal swimming pool, car park / rastro market, and a parade of shops, bars and restaurants where you can find a typical English fry up at the Bar Cafe’ Ole, the weird and wonderful Hallelujah bar, a Fish and Chip shop amongst many others. Across the bridge are a number of urbanisations and detached villas scattered up the mountainside offering fantastic views across the town to the Bernia mountain range which have proved very popular with foreign property buyers. So just what is it that’s so special about Jalon Valley? Life in the Jalon Valley offers the best of both worlds, it is not a tourist resort flooded with foreign visitors for 6 months of the year, neither is it a remote Spanish village, it is just 15 minutes drive to the coastal town of Calpe, and 25 minutes to either Denia, Javea or Moraira. You can see the foreign influence in the wealth of international restaurants which have opened in the valley in recent years, in the glittering array of arts, crafts and gift shops and in the local newsagents now selling the Sun and Daily Mail alongside El Pais and Levante but at the same time the local master butchers produce a mouth watering array of home made sausages from secret recipes passed down through the ages, the valley is still producing its own honey, and the local farmers still go out on their tractors in September to harvest the almonds and bring the grapes into the local wine co-operatives. Jalon is the only place in the Vall del Pop which can reasonably be referred to as a town. It’s the biggest and most cosmopolitan of all the pueblos but it’s important to remember that there’s more to the valley than Jalon (or Xalo as it’s called in the local Valenciano language). The villages of Lliber and Senija lie to the east of Jalon and to the west are Alcalali, Parcent, Benichembla and Murla. At the source of the Jalon/Gorgos River, 20 kilometres from the town of Jalon , you’ll find the charming village of Castell de Castells – it’s the most remote pueblo in the valley and because of its distance from the coast it remains relatively untouched by tourism. Although a supermarket has been built in recent years (Masymas), most shopping in the Valley is still done in the small individual shops (which can be very frustrating if you are not used to the Manana, Manana way of life), or at the fruit and veg market held on a Tuesday. No-one is in a hurry and you can often wait up to 30 minutes to be served whilst the locals and shopkeepers catch up with the latest gossip. In the award winning Galan butchers, they even provide seating so you can sit comfortably, chat and wait your turn. The arrival of Iceland in Benissa changed the shopping experience for many Brits anxious to get hold of certain items unavailable at the time in Spain, although getting there is a problem if you don’t drive – there is no public transport in and out of the valley. The Spanish villagers still take their chairs out onto the pavements and while away the hours on summer evenings chatting with neighbours or simply watching the world go by, and children can still be children, unlike in the UK. They play in the streets until late at night, pelota (a type of team ball game) games are set up in the narrow roads, and ‘dens’ are built on the numerous vacant pieces of land that are dotted around the outskirts, safe in the knowledge that the whole community is watching out for them. Each town/village has their own Patron Saint and each year a week long fiesta is held in their honour during which time the town celebrates day and night with dancing, live bands, processions, huge firework displays, water fights provided by the local bomberos (fire trucks), bull running and plenty of eating and drinking, usually in the plaza, or town square. The main fiestas in Jalon are the Fiesta del Romero in Apri, Moores and Christians in July and the ‘not for the faint hearted’ bull running in August. Despite is reputation for being a stunningly beautiful and peaceful location, the Jalon Valley has its fair share of nightlife. Apart from its varied restaurants and Tapas Bars, there are a number of English bars that offer live music and two nightclubs, Can Tallarina and the Cadillac Bar/Nightclub virtually next door to each other but just far enough from residential areas to be unheard. These clubs are not just for the young, locals and expats of all ages head there after an evening of drinking Jalon wine elsewhere in the village. When it comes to eating out, the Vall del Pop (or Jalon Valley as many foreigners know it) is one of the favourite spots in the entire Costa Blanca region. Spanish and ex-pat residents the Vall del Pop appeals to the palates of people from far and wide. Whatever time of year they visit, day trippers can take their pick of traditional tapas bars, quality restaurants serving exotic international dishes, family run Spanish restaurants offering cheap and wholesome “menus del dia” and good old English fish and chips. The valley offers everything from Mexican, Moroccan and Chinese food, bistro-style menus and stylish haute cuisine through to sausages and mash, English-style Sunday lunches and delicious local putxeros and paellas. There are also some amazing restaurants way up the Bernia, the old Donkey Sanctuary perched right at the top offers amazingly good food and fantastic views although some parts of the road on the way up are not for the feint hearted. All in all, the valley’s restaurants have something to suit all tastes and budgets.